As we return from a trip to Dubai to celebrate our friend’s wedding, we thought it’s probably time we share with you another part to our wedding. Our ‘mini moon’ in Morocco. Before we begin you should make sure (if you haven’t already) that you’ve checked out our wedding post which is the one before this, or you can just click HERE. You might also be interested in checking out the amazing feature we are proud to have had on Love my Dress HERE. We’d both always wanted to go Morocco. Carlos had been many years ago while living in Portugal but didn’t venture far and didn’t remember enough to not want to go back again. We both love the Moroccan décor, food and vibes so with it basically on the doorstep of southern Portugal, we decided pretty quickly it would be a great place for us to unwind after the wedding madness. We were both incredibly stressed pre-wedding. We both like to make sure things are perfect and in fairness we took a lot on with the wedding planning / holiday planning for everyone, we honestly had hugely mixed feelings on the week of the wedding. We were both so excited we could burst and couldn’t wait to be married and celebrate with friends and family, but there was also an underlying feeling of wanting to get through it all just so we could finally unwind, enjoy married life and get back to a normal routine. It felt weird to feel that way but we’re pretty sure it’s a feeling most people encounter while planning for their big day and ironically, we miss the stress now and would pay good money to travel back in time to do it all again. We pretty much had the place to ourselves during our stay at the hotel and the rooms and beds were some of the most comfortable we’ve stayed in. We enjoyed the spa treatments and wandered around the grounds and visited the hotels very own farm. They keep animals on site, not to eat, but to keep a local style of life within the hotel.I don’t think vegan is very common in Morocco but there are plenty of ‘accidentally’ vegan food within their normal style menus but every day we were spoilt by the chef creating new dishes catered to our needs and requests. Our normal travel style would be to move from place to place and fit in as much as possible within our holiday time and although the plan for this trip was to switch off and do nothing, after 3 days we started to get itchy feet and realised that maybe we were unable to ever just switch off! 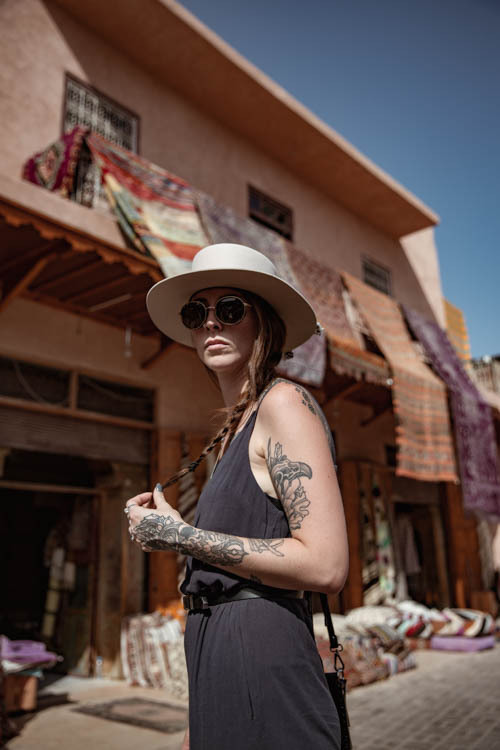 We took a day to explore the souks, do a little shopping and buy ourselves some treats, when we got back to the hotel we decided we needed to book a trip, explore and experience something more. After a quick search online we came across Beyond Morocco a luxury travel company who assists in off beat trips in comfort and can help organise local events or parties on your behalf. They pride themselves in both their knowledge and their service which is exactly what we needed. We reached out to the team and got a very prompt reply back from the founder and he suggested meeting up to discuss what we would be looking to do over the few days we wished to spend away. With little knowledge of the surrounding areas and no specific ideas we met up but left it down to them to choose and before we knew it we were off on our mini adventure within an adventure. From our current hotel we could see the breath taking views of the Atlas mountains and beyond, it was an area that had interested us and somewhere we jumped at the chance to be amongst. We laughed on our way there as we found ourselves driving down small rubble tracks and getting lost through villages thinking “why do we always like the look of the places which are hardest to get to! ?” but when we arrived at our first overnight stay we knew it was worth the journey. Kashbah Baborika is perched within the breath-taking Atlas Mountains and peers into the Ourika Valley. We were given a room with our own huge private balcony area looking directly into the valley. When we first woke up and explored the view the first thing we thought was how small we felt amongst such a vast and wide landscape and secondly like we’d be plonked in the middle of a Thunderbirds film set. The moving sun made the landscape ever changing and we lost ourselves staring into it multiple times throughout the day. The grounds and rooms at the Kasbah were each individual and like the Le Paysan and paid homage to the local traditions of property building. It was a fort of reds, oranges, beige and browns which gave of this constant warm glow. The interior is something I could only aspire to for our future home, mixing the modern with the classic Moroccan vibe and plenty of classic mono Berber textiles. We ate breakfast overlooking the valley and realised that we were sharing the grounds with, once again, very few people and got to enjoy the serenity of being so high up. We were then kindly shown around the grounds and a couple of the other rooms including their beautiful suite, which is now firmly on our ‘must do’ list, although with its large open space and private infinity pool, it is much better to enjoy with family or friends. We highly recommend this hotel to you all if you are looking for a little bit of luxe, quiet time at a short distance from the madness of Marrakesh (We’d say it’s a 30 – 40 minute drive, your own car would be helpful, however, the hotel can arrange transfers for you easily). Our next stop was to Essaouira which is 2hr 45min hour drive outside of Marrakesh and situated along the west coast of Morocco. We decided to spend one night in Essouria town but before that to spend one night a little bit further down the coast in Sidi Kaouki. 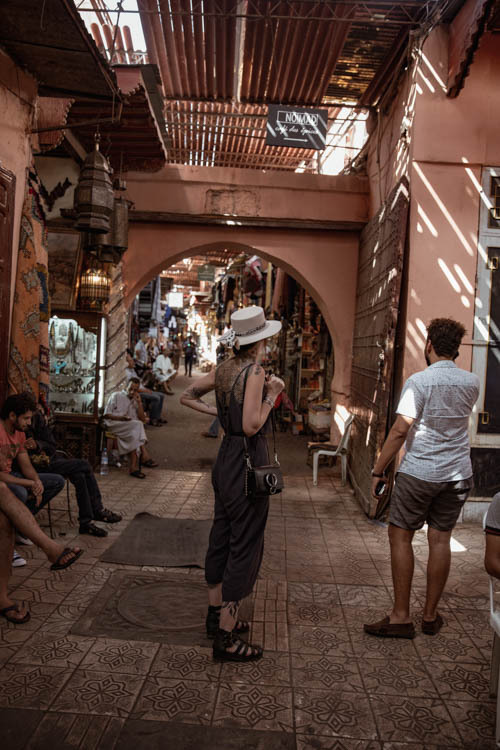 This smaller town had a real chilled vibe to it, it had the home village Moroccan feel with a pinch of boutique souks and cafes, the perfect mix! We had booked to stay for a night in the amazing Rebali Riads just a short walking distance from the beach area. We arrived by night and our only regret was having not arrived earlier. The hotel offers a variety of rooms available in riads and private villas with sea views, a communal pool (with even the option of a private one in one of the villas) as well as a hamman. The thing we really loved about staying here was although you got the space and privacy of a self-catering place (oh and by the way, our villa included a remote controlled glass ceiling which you could open!!) you had the bonus of having access to hotel treatment and being served our breakfast on our private garden area was such a treat! I do want to mention a small story that happened to us on our way here using our sat nav, we got a little lost on the way to our location. Well, not lost, but the map had potentially thought a road it had down was a little more accessible than it actually was. When we travelled down it, it wasn’t like a road at all, however, I feel like it was slightly fate we were sent down there. As we were driving along we notice a bunch of kids laughing and running around, as we got closer we realised they had a small young cat/kitten and were grabbing it and throwing it around. If you’ve been to Morocco then you will know that you will see a lot of cats and kittens about, there’s a huge homeless issue for the cats and although in lots of ways they are respected, like a lot of countries the animals are wild and homeless and a lot of the younger kids are raised without showing respect to the animals. We stopped the car got out and spoke with the kids who instantly tried to pretend nothing was happening, we were with a local speaking guy who meant he could speak to them in their language. They explained the cat was a stray that had been hanging around and didn’t belong to anyone. After a small chat trying to let the kids know that this is not the way to treat an animal, we decided we couldn’t leave it there for the same to happen again and we just took the cat with us, the cat stayed with us while we were in the new area and we gave it some food and rest to recover, we checked her over and there were no issues. About 30 minutes before we left she disappeared and we hope that she is ok. It’s an important little story to us and I will explain more later!! After a short 24hours in Sidi Kaouki we headed further north to our original planned destination of Essaouria town. As soon as we parked in the car park and walked across the town port we instantly fell in love with the surroundings and we were incredibly excited to arrive at our hotel destination which is the visually stunning Salut Maroc. Having only been open a few months we felt truly blessed to be amongst the first to be calling it home for the night. After arriving, we got to meet with Helen the lovely and creative mastermind behind the Salut Maroc Riad. She gave us a guided tour around (almost) all of the 11 colourful and different themed rooms. Helen had poured her blood, sweat and tears into the Riad over the years she’d owned it, buying the 18th century derelict and dilapidated building in the heart of the medina and turning it into a contemporary take on Moroccan design with an exciting explosion of colour and stories. You can see the love that went into every small detail around the Riad and the respect that Helen had to create a homage to the Moroccan culture and history of their building structures so that she could compliment and add to the already beautiful surroundings. 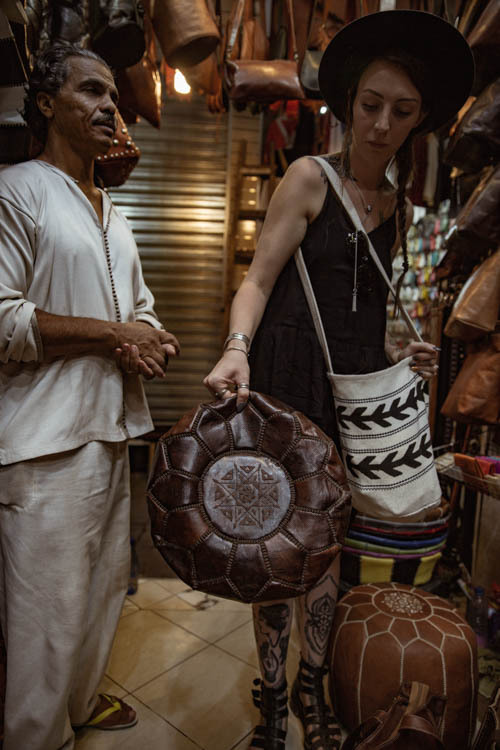 Helen has spent a lot of time travelling the world for work and pleasure in previous years and had been collecting art, furniture and decorative items, storing them for the right project, lots of which you will find used at the Salut Maroc. After spending 30mins walking around with our mouths wide open and listening about the story behind each room Helen allowed us to pick the room we most wanted to stay in. Automatically drawn to it as soon as we walked in we decided to go with the Berber room but in all truth, you couldn’t be unhappy in any of the magnificent and carefully planned out spaces. Just above the three winding floors and the riads own Hamman (which we both tried out and confirm this is a MUST when you stay) the Salut Maroc has a roof top bar and restaurant which is open to all not just the guests. We enjoyed an evening meal and breakfast on the roof looking out at the Atlantic Ocean and can vouch for one of the best meals we had during our Morocco stay trip. Helen was just in the finishing stages of also opening a covered indoor area for the restaurant because, even though by day the area was hot, we were visiting during the more ‘winter’ months and being by the sea the evenings got cool so Helen wanted to offer a retreat for the chillier times. We actually got our longest time to spend here on our mini trip and we were so glad for it. The medina boasted the Moroccan market stalls (without the Marakesh madness) and mixed in were boutique stores and cafes. There was a great little antique / vintage shop just around the corner from the Salut Maroc and we ended up buying quite a few pieces of jewellery from here. It’s easy to be conned in certain areas of Morocco but having met and spoke with locals we felt comfortable to buy from him and the pieces we now own are one of a kind and firm everyday favourites! They’ve made the perfect keep sake memory items from out mini moon. It’s worth noting that prices seemed to be much cheaper over here and we wished we’d waited to purchase some of the items we took back but you live and learn and it’s probably not best to go around cross-checking prices as you are bound to be disappointed. My moto is if you like it enough that you’d regret not buying it then settle on a price that you are happy with and look no more! During our time, we didn’t rush and instead shopped, explored the streets, enjoyed some local food and some tea but we feel we could have done so much more! If we’re to come back to Morocco we’ve decided to fly into Essaouira (since they now have their own airport AND the flights are really reasonable!) and totally insist that you too make the effort to visit the area! Back to Salut and the highest princess queen-sized bed in the Riad (naturally) and we slept like never before! We felt sad to leave but excited to get back and enjoy our final day and night back at the Le Palais Paysan and the madness of Marakesh. With some final shopping to do and a pool side bed with our name on, we ended our trip just the way we started, doing sweet FA. While also in Essaouria I met a lady called Liv. I had been buying Tuna for the cats and very young kittens which were sleeping outside the Riad. Liv had been circulating, since moving to the area, helping out the kittens with vet trips, vaccinations, food and care. I happened to bump into her while she was on the rounds with a vet she had met to work with and I said I would like to help in anyway that I could and you may remember me talking about this on my IG accounts on my stories and HERE. Since returning from Morocco Liv and I have stayed in contact and we are working together to try and raise money and help to give the kittens a healthy start to life. We want to help to caring for the kittens, vaccinating them and hopefully successfully neutering them before they get pregnant. 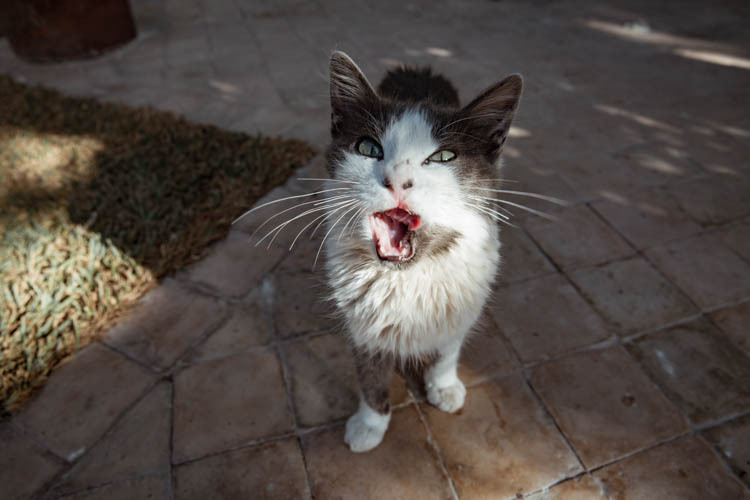 We want to keep the mummas healthy and also attempt to neuter as many of these as well as the males to help keep the street cats to a minimum. Right now Liv has been working with the locals to use some money to create small wooden houses for the cats to live in rather than the cardboard boxes which get tatty and ugly quickly and don’t provide enough warmth for the cats. She’s also still checking in with the different ‘camps’ daily and moving kittens to new mums if rejected and generally just being a superwoman in many ways. I was really happy to send Liv £350 after my trip away and now we want to continue to help more! I’ve set up a website, which is not yet fully running, but is able to take donations which get used directly to help the cats and kittens. Once I have more info and the website fully running I will share more information but knowing we have lots of fellow animal lovers, we urge you to please head over to the website and make a donation big or small so we can continue to help all that we can! In short Morocco stole our heart and we wish we'd of had more time to spend exploring. This trip gave us a small taste of the many more memories we could create there and so we look forward to returning as soon as we can to start creating more of them.